Please go to the NOTICES page to see the latest information posted. 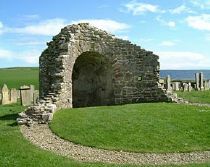 There has been uninterrupted christian worship in the parish of Orphir since the ancient Round Church was established at the Earl's Bu in 1127 following the Norse Crusade to the Holy Land. The Round Church is thought to have been inspired by the Church of the Holy Sepulchre in Jerusalem. During the period of reformation there were two centres of worship. The St Nicholas (Auld) Kirk (built in 1757 next to the Round Church) and the present (Free) Kirk built in 1881. Services were held in each on alternate Sundays and one had to remember which place to attend. Some parishioners would only go to one but almost everyone went to one or the other.The Auld Kirk was subsequently demolished and the Round Church is now maintained by Historic Scotland. 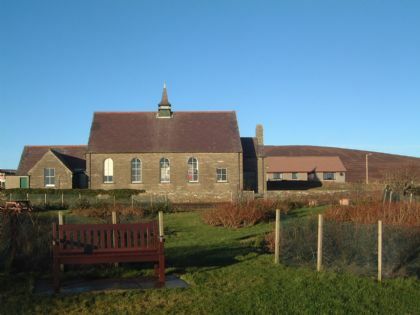 An open air service is held there at 8am on Easter morning (in all weathers! ).